From sunrise to sunset, yesterday was crazy. First, battling a cold completely confused my mind, which resulted in a non-Goldbergs blog post. Have no fear though, that’s partly what today is for. Erica wanted vehicular freedom from gas tank-obsessed Murray, so she manipulated Barry’s A-Team singing sweet spot that results in the best/worst van purchase of all-time. Meanwhile, Adam sought to rid himself of being known as “the nice guy.” This brought out Adam’s inner Don Rickles and Andrew Dice Clay, to the obvious anger from his family/comedic targets, to amplify his rep as the class clown. Adam’s journey to discovering his identity in middle school was an all too real portrayal. We try so hard to fit in and to be the person everybody else wants us to be. It’s a terribly awkward, embarrassing and frustrating moment in our lives. As for Erica and Barry becoming known as “van people” in their neighborhood (including their principal), all it took was delicious secret corn, the B-Team (for Barry) gas tank emptying and two genetically stubborn people conversing (Erica and Murray) to realize living in a van was not an ideal situation. Plus, the ’80s classic, “The Way It Is” by Bruce Hornsby & The Range helped significantly. It’s a wonderful thing to have such a nice, funny family on television. Second, CBS owned last night’s sitcom battle. As in completely and entirely. The evening began with an emotional Big Bang Theory that finally dealt with the real life death of the wildly funny Carol Ann Susi/Mrs. Wolowitz. It coincided with the re-opening of Stuart’s comic book store with a sharper look, including some familiar furniture as pointed out by Howard. Plus, the phrase “let it go” got a genuinely welcomed resurgence back into our psyches thanks to Penny (inside joke for viewers of the episode). Following the #1 sitcom on television was the premiere of CBS’s next great sitcom, The Odd Couple. Written as a modern revival to the ’70s comedy, it stars Matthew Perry (Oscar Madison) and Thomas Lennon (Felix Unger) as, well, an odd couple of roommates. For a pilot, it was fantastic! The writing and on-screen chemistry started slowly, as expected. But, by the end, the characters and writers revealed a promising (and hilarious) spark that will build into a roaring good fire of laughs. Like most great sitcoms, it will take a season or two to find its rhythm and pulse of its characters and story. Recall the necessary patience and development it took Seinfeld, Frasier, That ’70s Show and Friends to find its genius a few seasons in. The Odd Couple has an awesome cast and as they continue to fall into their respective roles more naturally as time goes on, this show will prove to be really special. Matthew Perry and Thomas Lennon have finally found their successful follow-up roles to their iconic television characters of yesteryear. Following an unlikely 12-year run on CBS, Chuck Lorre’s raunchy, addictive and tumultuous sitcom came to an end last night. Having been at the taping for a couple scenes in the series finale two weeks ago today, which included Rose revealing Charlie was alive in the Malibu living room with Alan, Evelyn and Walden and Jake’s surprise return, it was still a tightly-held secret if Charlie Sheen would actually return. As curious viewers discovered, Charlie made a cameo as a Warner Bros. cartoon and, courtesy of a convincing stand-in from behind, in the must-see final scene. The finale had plenty of laughs, especially with funny pans and one-liners to studio cameras about the show and a series recap with guest officer Arnold Schwarzenegger interviewing Alan and Walden as part of their pursuit to find the raging and “Silence of the Lambs-escapee” Charlie from Rose’s Sherman Oaks dungeon. 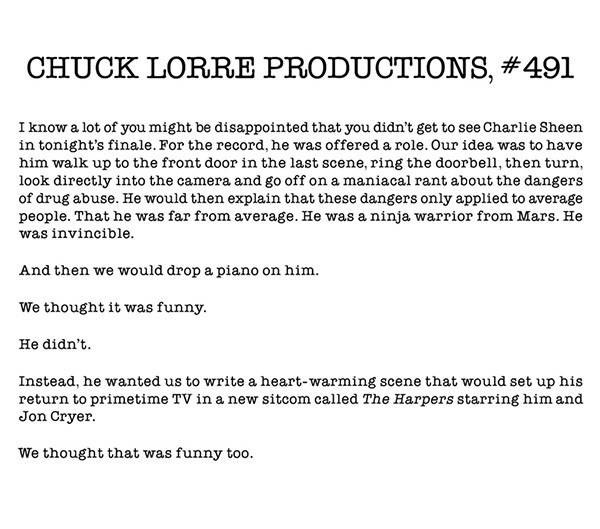 Posted on February 20, 2015, in Uncategorized and tagged "The Goldbergs", big bang theory, CBS sitcom, Charlie Sheen, Chuck Lorre, comedy, entertainment, funny, Hollywood, Matthew Perry, popular culture, series finale, special surprise, The Big Bang Theory, The Odd Couple, Thomas Lennon, Two and a Half Men. Bookmark the permalink. Leave a comment.